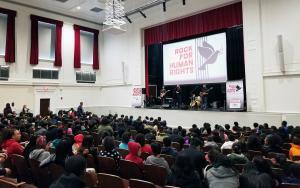 Rock Band Plays an Unexpected Role in Creating Human Rights in Schools. There were 689 press releases posted in the last 24 hours and 153,511 in the last 365 days. 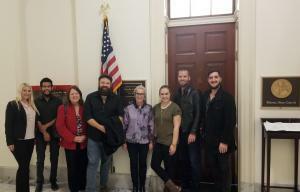 Rock for Human Rights Band Members met with multiple Congressional Offices advocating for human rights education in schools. Rock and roll music group stops in Washington DC to educate youth as a part of their 30 Cities in 30 Days National tour on how to protect basic human rights. 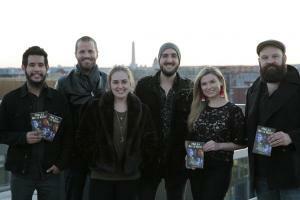 WASHINGTON DC, DISTRICT OF COLUMBIA, UNITED STATES, October 29, 2018 /EINPresswire.com/ -- Rock and roll music group stops in Washington DC to educate youth and Congress as a part of their 30 Cities in 30 Days National tour across the country on how to protect their basic human rights. Rock for Human Rights (R4HR) is a rock and roll group with a mission: to educate kids about their human rights through music. They are celebrating the 70th anniversary of the United Nations Universal Declaration of Human Rights with their “30 Days—30 Rights Tour,” hitting 30 cities in 30 days throughout October 2018. Rather than playing in clubs or concert halls, most of their venues are schools. “Rather than focusing on all that is wrong around the world, Rock for Human Rights seeks to uplift and educate its audience through the power of live music and film. The ripple effect of an entire generation of young people educated on their fundamental rights can’t be overstated. Knowledge is the first step to understanding and genuine change.” says R4HR founder and lead singer Wil Seabrook. In partnership with Youth for Human Rights, Rock for Human Rights uses the power of rock music, social networking, and visual media, specifically the short film The Story of Human Rights and 30 accompanying public service announcements that beautifully illustrate each of the basic rights fundamental to every person. Rock for Human Rights (R4HR) is a 501(c)3 registered nonprofit dedicated to using engaging videos, live music and lively discussions to inspire and enlighten audiences on their basic human rights. Youth for Human Rights International and R4HR have partnered to bring the kind of uplifting, engaging human rights education that provides students with concrete steps they can personally take to bring civility, respect and open communication back into every community. For more information on Rock for Human Rights, please visit www.rockforhumanrights.org. Youth for Human Rights International (YHRI) is a nonprofit organization whose mission is to teach youth about human rights, specifically the United Nations Universal Declaration of Human Rights, and inspire them to become valuable advocates for tolerance and peace. YHRI teaches human rights education both in the classroom and in nontraditional educational settings such a through art series, concerts and other interactive community events. Their most recent campaign has included #KnowYour30 with the deliberate purpose of increasing awareness of the 30 human rights every person has -- and how they are a part of everyday life. To learn more go to https://www.youthforhumanrights.org or watch a documentary on how Youth for Human Rights began. While Government Officials Fight the Current Epidemic of Drug Overdoses, What is Being Done to Prevent Future Users?